RIDDLE OF THE DAY: What causes schools to close, leads to massive traffic accidents, requires huge trucks and tons of salt to control, but has absolutely no effect on runners? Sunday morning was the 2015 Running Fit Super 5K, and over 1,500 unstoppable runners showed up – because, after all, what else would they do on Sunday morning before the Super Bowl? While they’re all badass, especially the ten runners aged 70 and over, I think the baddest were the 20 who took over an hour to finish. 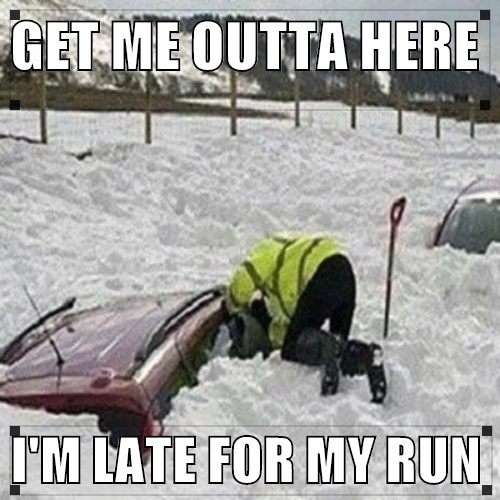 That’s a long time to slog through slush and cold for a medal, pint glass, and a hot dog or two. The snow had already been falling a while when I pulled out of my driveway and headed to Novi. I gave myself extra drive time and arrived early enough to get my race bib and warm up (somewhat). 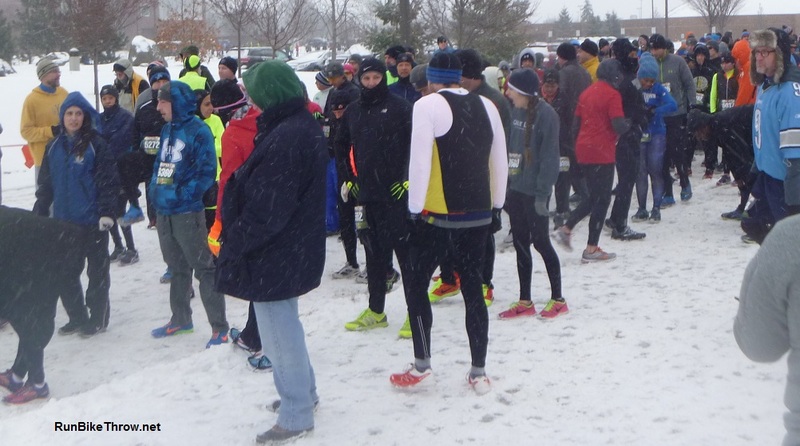 Thankfully, the venue had changed from the Novi Civic Center to the high school, avoiding the frostbite-inducing quarter mile march of previous years to the starting line. The consecutive streak ends at 26! My bib number was an unintended tribute, I guess. As the roads had not been fully cleared. I wore my Saucony Peregrine trail shoes for extra traction. Others wore Yaktrax or put sheet metal screws in the soles. 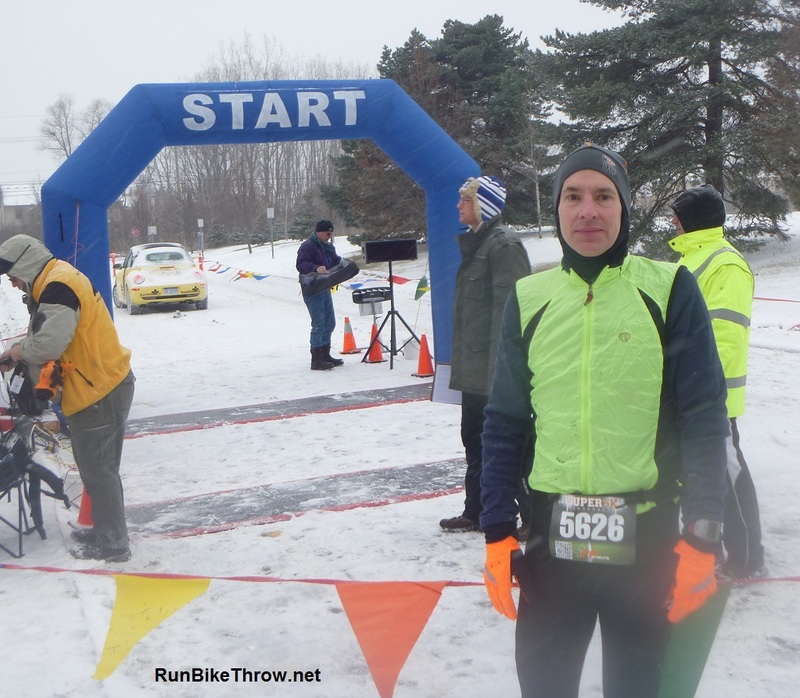 While snowy and windy, the temperature was in the low 20s, positively tropical compared to the last four years, so my Heater Hog and a light wind vest kept me plenty warm, once I got going. The race starts down a main road and tucks into a private subdivision about a half mile in. Although it’s a loop, it seemed like twice as much uphill as downhill, especially in the second half. This actually helped my cause, as I passed a lot of people losing steam on the long, slow rises. I was breathing pretty hard myself, but all that trail running pays off in races like this. 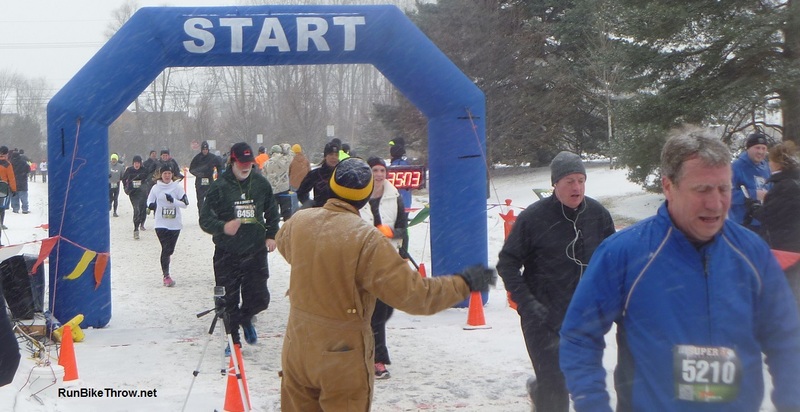 I finished a minute faster than last year, which was in deeper snow. I managed third in my age group, but once again, like in Bigfoot, I beat everyone in the age group below mine. “I wish I were 49 again,” I said to a friend. “I’d be winning my age group!” Maybe I’ll have to start lying about my age. On the other hand, the finishers over 70 got the most applause. The post-race food was junkier than average, by design due to the Super Bowl tie-in. 9:30 a.m. is too early for me to eat a hot dog, but I broke down and had some of the meatballs – and went back for seconds. Dang, they were good. Turned out I needed those calories, as I spent the rest of Sunday, and Monday morning, shoveling my driveway. This was a bittersweet race for me. It marks the end of 26 consecutive Running Fit events, starting with the 2013 Holiday Hustle through every event in 2014 and the first two events of 2015. Due to other commitments, I won’t be at the Dances with Dirt Green Swamp and Shamrocks & Shenanigans races next month. Ah, well – looking forward to the Pi Day run with my daughter on March 14! At least this streak continues! 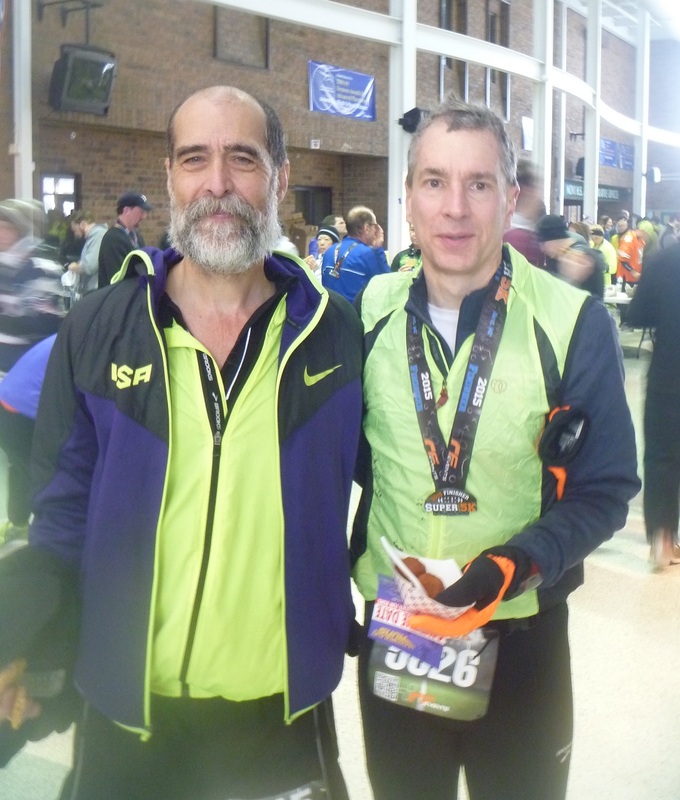 Post-race with fellow PR Fitness racing fiend Michael. 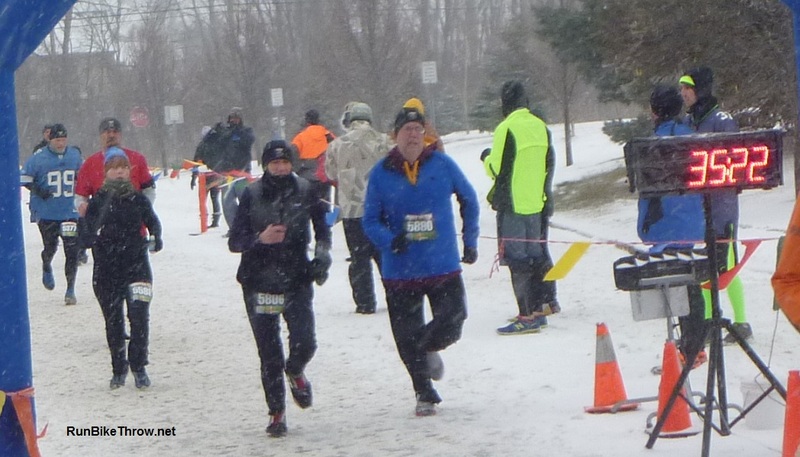 This entry was posted in Running & Cycling and tagged 50, 5K, fitness, Novi, Running, Running Fit, snow, super 5k, super bowl. Bookmark the permalink.